Richard Cahan, who co-authored two collections of Vivian Maier’s work, talks to the crowd about the Chicago photographer’s early life in France. 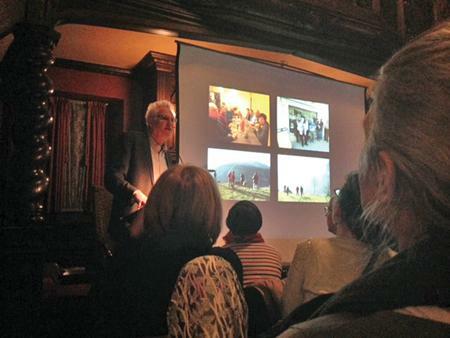 Cahan presented the lecture on Maier as part of the Evanston History Center’s Under the Buffalo Presentation Series. The Evanston History Center presented a lecture Thursday night on the late Chicago photographer Vivian Maier, highlighting her ties to Evanston. Richard Cahan, the co-author of two Maier photography books, gave the talk, titled “Photographer Vivian Maier: In Evanston and In the World,” as part of the History Center’s Under the Buffalo Lecture Series. This was the first lecture of the center’s Winter 2015 series, said Jenny Thompson, the center’s director of education. Addressing a crowd of about 120 people, Cahan said he had been traveling around the country speaking about Maier, and in every location, he had presented to a packed house. Throughout his lecture, Cahan touched on topics ranging from Maier’s years as a nanny in the Chicago area to her travels around the world. She was a very private person and few people knew she was a photographer until her photographs were shown for the first time in 2012 after being discovered in 2007, he said. Born in New York in 1926, Maier moved to France when she was very young. She returned to America in 1939 but was back in France by 1949, though not much is known about that time, Cahan said. Maier took many photographs in France, but most of the work Cahan showed at the presentation was taken in Chicago, where she moved in 1956 and stayed until her death in 2009. Cahan focused mostly on her street and everyday photography, which made up the majority of her work. The photographs presented depicted objects as simple as rakes against a wall or leaves on the ground. Many were straight-on shots Maier took of people she came across on Chicago streets or children playing on the beach. Joanne Zolomij, an Evanston resident who attended the event, said she loved the pictures shown and was interested by Maier’s story. When asked why Maier was not famous during her lifetime, Cahan speculated that it was because she was ahead of her time and the world hadn’t caught up with her yet.